remember my new idea from yesterday? let me introduce......Pebble Key Rings.....ta-dah! perfect pops of colour to cheer up your keys! I've made them quite stiff by using lots of interfacing and extra layers of felt (but it's hard to tell that from photos) as always they are cut by hand and I've used a mixture of machine and hand sewing. ....and all the other key rings in my shop! I have run out of hand sewing to do at home - and because we have another 4 day weekend looming I thought I had better stock up...so I started to cut out this little lot yesterday, and after a couple of hours today it's all prepped ready for the weekend! I've even managed to squeeze in making some new packaging...I'll show you it all tomorrow when I am finished! I also managed to catch up with the accounts and then started some cutting out, which will be finished tomorrow! phew! what a fun day! 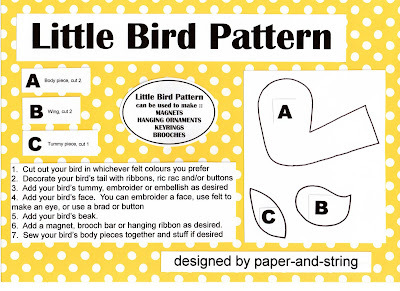 I've been working away on a tutorial for you all so you can make some Little Birds all of your own. They are great fun to make ... using all of my favourite supplies, lovely felt, ribbons & buttons. which are quite hard to photograph whilst wearing!!! I also made two Little Bird ornaments which have left me wanting to make a whole flock of them into a Little Bird bunting type decoration...wouldn't that look great? If you click here you will be taken to Flickr, where you can 'view all sizes' (in the actions menu above the picture) Download the Large size and then print off an A4 copy...easy peasy! the one upside of John working away all week is that I have a lot more sewing time in the evenings. and my fabric mushrooms now look even cuter with ric rac and button prettiness! John will be home tonight, but don't worry, the sewing never stops round these parts, in fact I've been working away on a new tutorial, which will all be finished and up for you on Saturday, you'll need some felt, ribbon & buttons, and some time to sit in the sunshine and sew! each (clean) drawer now holds the printed pieces for my kits ... oh it's good to feel organised! Customers from my shop who also read this blog will know I offer a loyalty card. once the cards are full Free Craft Kits are sent out with the orders...and these past few weeks I've sent out loads!! I have to admit that I've been making them as-and-when-I-need-them, so today I set aside some time to make a whole stack of them. I love that they look a bit dull and boring in Brown Paper Bags, no hint whatsoever of all the lovely colour that's inside!! John is working away in Hull again this week...but only a short week because of the Bank Holiday on Friday (thank goodness, I don't like him working away so much) he went yesterday afternoon so I spent the rest of yesterday cutting & folding this shoe box full of stationery, and hand stitching these owls which were turned into boxes for an order today. unbelievably I have been in my new workshop for 3 weeks already...so I thought it was about time for a better tour...starting with my ribbon alcove. I've used these trays for a while, here's another on a table top used for storing brads. they hold all my metal findings which I keep in plastic storage jars from Julian Graves. they are the absolute perfect size for my large ribbon spools!!! something a little bit more 'grown-up' .... and there are loads more on there too!! It's John's birthday today so we're off out tonight with some friends for drinks in our local pub, hurrah! Tomorrow it will all be finished and then I will start adding the deco-tapes to the website! I have taken tonnes of photos and if all goes well with the computer I will be adding these to my shop tomorrow! wow, 301 comments...there are lots of ribbon fans out there! *wave* hello ribbon fans, pleased to meet you, I'm sorry you couldn't all win a box of ribbon. well done pretty petal handmade, I shall email you in a moment. Roll-up, roll-up! it's April freebie time! here's the prize all prettily wrapped, but what's in the box??? and 2 ribbon gift packs, all wrapped up with even more ribbons! 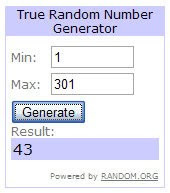 The freebie will close on Monday 11th April 2011 & the winner announced shortly afterwards.